This all aluminum hand truck is a great dolly for any home or warehouse. 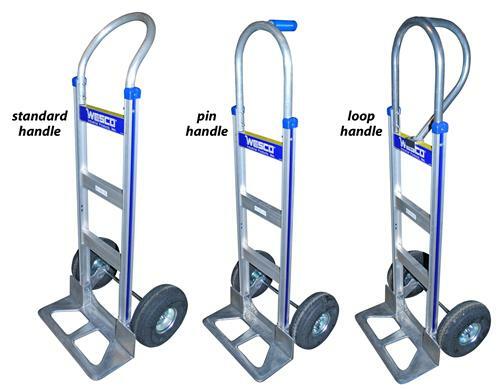 Load and lift equipment, boxes, and other heavy items with ease with this hand truck. High quality construction provides durability and easy loading of heavier items. The wheels are inflatable, pneumatic tires and make for smooth movement and handling. The handle allows for one hand operation and the rubber tires cushion the load to allow the truck to roll over uneven surfaces. This hand truck requires assembly. 3 Handle Styles to Choose From: Standard, Pin, and Loop.